One of the most impressive details about the Fling Kings, they are designed for a JConcepts (#3379B) 2.6” wheel, making them even more scale in appearance. The bead of the tire features a 3 step surface which provides a massive amount of area for glue to rest giving the utmost security for full-throttle mud runs. No details were spared on these mud runners, the V-type tread is replicated to a T and the top of the tread carries a slight recess adding a little touch of depth to the appearance. Off to the side, the tire lettering hits hard with retro style JConcepts lettering, Fling King logo and crown with #3155 part number for easy identification. 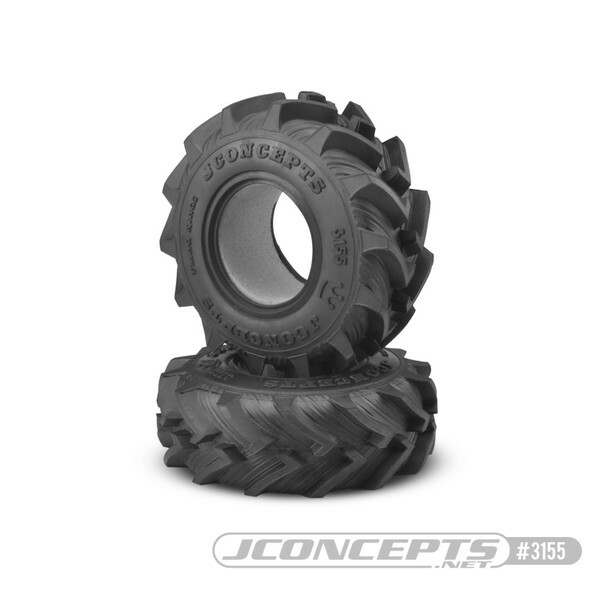 The JConcepts tires mount directly to the Dragon (#3379B) 2.6” wheel which feature 12mm interchangeable offset adaptors and polycarbonate face plates. The Fling Kings will dig hard and test the performance, durability and power of any RC vehicle. Its encouraged to chose running conditions carefully, beef up your rig to handle the grip and get ready for a wild dirt roosting RC experience. Shipping Charges: Our shipping charge for tires is $6.50 for the 1st item and $2 for each additional pair purchased.